If you’ve ever wondered how you can colour the back of your hair by yourself, you’re not alone. It’s not necessarily obvious, but you can get it right and get even, consistent colour results with a few handy pro tips. We’re breaking it down for you in an easy to use guide to help you out with this common home colouring predicament. The good news – with a few steps straight from the salon, you can master this move, really! 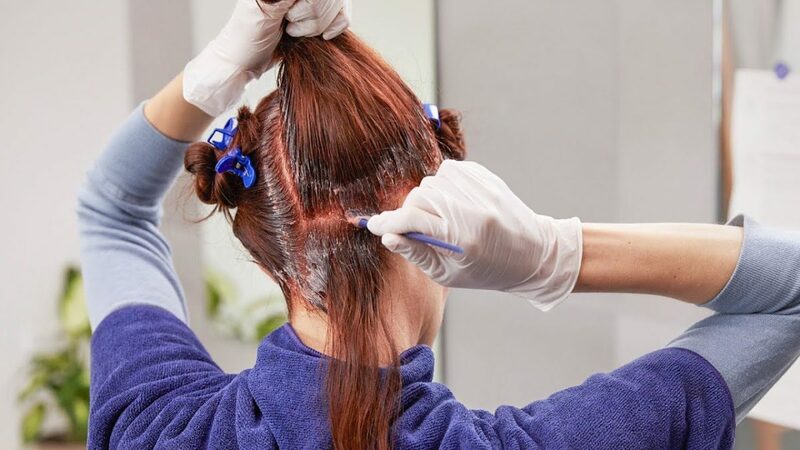 So read on to shed some light on this home colouring black spots, for spot free colour results and manageable techniques to colour the back of your hair. Twist and clip the hair in each section with the clips provided in your Free Trial set of salon accessories. Put on gloves. Unclip the first back section of hair. Start by applying colour to your part lines, making sure to massage the colour into your hair. Unclip the second back section repeat this process with the second back section, applying colour along the part and hairline. Starting at top of the back section, apply colour in small slices of hair as you work your way down, using your fingers to massage the colour in as you go. So, as with many things in life, a little bit of knowledge and preparation goes a long way. Just follow these 5 simple steps for professional, even, beautiful, spot-free colour even in the trickiest of places. If you have any questions, or simply want to talk about your hair, our colourists are available via email and chatbot to help you achieve salon results at home.